A couple of months ago, I had the privilege of hearing Radhanath Swami, a follower of the contemporary Bhakti yoga tradition. This strain of devotional yoga maintains that people who become aware of their spiritual identity share an imperative to reduce suffering in the world. I became aware of his visit to the small yoga studio across from my house in Aliso Viejo, California after seeing a flier on the wall at Native Foods restaurant next to the studio. As I read the flier, something inside of me was insistent on seeing what this man was all about. I had never at that point actually seen someone of his stature or background in person. I marked the date on my calendar and set my heart on going. The evening of his visit arrived and I set out for the yoga studio. On the way over, I tried to find every excuse to turn around and go home. I didn’t know anyone going to the event, I wasn’t sure if I was going to connect with the swami’s message or if he was a good man. While doubts filled my mind, I kept moving toward my destination. When I entered the Core Power Yoga studio, I felt instantly at home and found a spot in the cozy yoga room. She sang with such passion and devotion — the audience joined in and for about 10 minutes the mantra was repeated. There was so much warmth and love in the room, I could have heard it for hours. Finally the moment came, Radhanath Swami began telling his story. He grew up in Illinois in a Jewish home. At the age of 19 in 1969, he felt a calling in his heart to travel to Europe with a couple of his friends. After trekking around Europe for three months, he found himself in Greece with very little money. Camping out in a cave with his friends, one morning he awoke to a voice inside of his soul inspiring him to go to India. He listened to the call and backpacked from Greece to India. As he told his story, I was awestruck by how gracefully he spoke and his love for his Lord and humanity. It was clear that his travels through countries including Turkey, Afghanistan and Iran opened his heart and mind to the beauty of those he knew he could connect so deeply with. He told of an afternoon in Afghanistan in which he was having tea in a small shop with a man he had met and a boy entered — he was blind — his eyes deformed so much that it was hard to look at him. The boy pulled out a funny looking instrument that resembled a tambourine and started singing. His voice was clear and angelic. 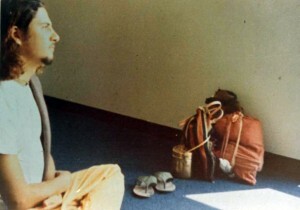 Words of devotion and love poured from his mouth causing Richard Slavin (Radhanath Swami’s birth name) to become silent. He was awed by what came from the boys soul, teaching that there is so much more to a person than meets the eye. The hearts cry is so very powerful when shared and heard. In India, Barry was able to learn from great sages including the Dalai Lama, Mother Teresa of Calcutta, Ananda Mayi Ma, Swami Satcidananda, and many more who make their appearances in his book The Journey Home. For nearly three hours, I listened closely and secretly wished that his stories would continue. I was so very inspired that this man had set his mind to accomplish something extraordinary. The majority of us human beings would sit back and scoff at the idea of traveling to other countries with only enough money to by an airfare and buy food for a handful of days — and then believe that providence would guide and care for us. We’d prefer our conventional lives while wishing that we could have the nerve to do something different and extraordinary with our lives. Radhanath Swami’s stories finally ended. I worked up the courage to approach him at the front of the room. He looked at me with compassion, and I thanked him for filling my heart and soul for a few hours. I left thinking about kindness and took it as an assignment, as a call to try my best to be kind to all that I come in contact with. 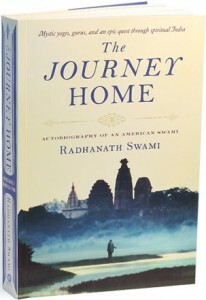 A few days later, I bought the Swami’s book The Journey Home. For a handful of weeks I couldn’t put the book down. His words were so very inspired in my mind and his heart true. He taught of the importance of humility, serving humanity, finding one’s own unique spiritual path, listening to others, expecting miracles and connecting with the Lord of the universe. In his mind, there is one Lord who loves and serves humanity, if they are only to open their hearts and minds. I recommend The Journey Home to all regardless of what faith/religion one participates in. It is a story for all — life changing!! Mind opening!! Awe-inspiring!! 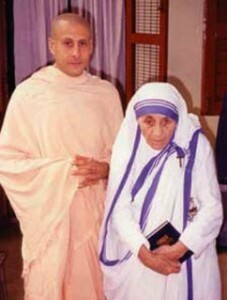 Thank you Radhanath Swami for your inspiration and boldness!! thank you Jen for posting this amazing article on this amazing book..
here is a website worth checking out where the author of this book talks about his experiences through out the journey..
Our aim is to go back to god. That is explained in this great book.